U.S. Marines pushed baby carriages and lifted children into transport boats Friday as Americans desperate to flee the Israeli bombardment of Lebanon lined up near Beirut's port as a massive evacuation operation picked up speed. Up to 5,000 U.S. citizens are slated to leave — the largest number in three days. About 4,000 Canadians were expected to reach Turkey by Saturday as Ottawa struggles to evacuate some 30,000 Lebanese Canadians. More than 2,400 already have been transported out, Canada's Foreign Affairs Ministry said. About 3,000 French citizens will have left Lebanon by Friday night, the French Foreign Ministry said, while another 4,000 to 5,000 others have asked to get out. Denmark evacuated nearly all of its 5,000 citizens Friday. About 6,400 Swedes have been evacuated. With tens of thousands of people flooding into Cyprus, the government there asked other European Union countries to speed up the repatriation of evacuees. Larnaca airport was crammed with both people and airplanes ferrying evacuees home. Cyprus is in the middle of its peak tourist season and the sudden influx also has put a strain on its hotels. But officials said the country had enough food, medicine and accommodation for the evacuees so far — including 6,000 spare beds. "We need help in the sense that we need more planes. We are receiving more people than are leaving. The problem is how to coordinate the arrival of the ships with the departure of the planes," said Alexander Zenon, general manager of the Cypriot Foreign Ministry. 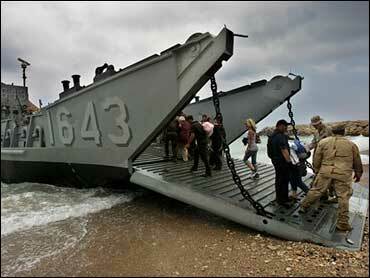 On Friday, boats were ferrying Americans from a Lebanese military base north of Beirut to warships waiting offshore. A commercial vessel, the Saudi-owned Rahmah, was to take 1,400 Americans to Turkey. Two amphibious U.S. Navy transport ships were to take 2,775 more Americans to Cyprus, and the Orient Queen cruise ship was to pick up another 1,000 citizens. Helicopters were still shuttling nearly 400 people a day as well. U.S. officials said earlier in the week that about 8,000 of the 25,000 Americans in Lebanon — many dual citizens who live there permanently — had registered for evacuation. They also suggested the operation could be wrapped up sooner than expected, perhaps as early as Saturday. In total some 25,000 foreigners have fled Lebanon since Hezbollah guerrillas captured two Israeli soldiers in a cross-border raid on July 12, setting off the Israeli offensive. Hezbollah has responded by raining rockets onto Israel. "We're really sad because we're leaving this way," said Maha Maher, 38, of Oklahoma City, Oklahoma, who was visiting family in Beirut with her two sons. "All that we wish is peace for Lebanon, because it's a great country. The Lebanese people are paying the price, and we feel sorry for this." About 200 Canadians, most of Lebanese descent, also assembled near the Beirut port waiting to be evacuated, many wearing hats or covering their heads with towels in the sweltering heat. Many said they were warned that not everyone would be able to leave Friday. Lama Ghandour, a 38-year-old mother of three from Ottawa, has not been back in Canada in 10 years and did not want to leave but was doing so for the sake of her children. She traveled to Beirut from Nabatiyeh in southern Lebanon, which together with the eastern Bekaa Valley and Beirut's southern suburbs have been hardest hit in Israel's 10-day offensive. "I called the embassy the first day of the fighting and said we wanted to leave. They told us to stay put until we hear from them. I kept calling them every day and then we decided to come to Beirut," she said. Many expressed frustration at the pace of the evacuation. "I never thought I'd live to see Canada treat people like this," said Zeinab Farhat, 46, of Fort McMurray, Alberta, who waited in line for nearly 10 hours Thursday without learning whether she would be able to depart. "I keep thinking I'll wake up from this horrible dream," she said, crying. At a camp in Cyprus for evacuees waiting to return to the United States, Rima Fawaz recalled her children's trauma at seeing warfare for the first time. The family was vacationing with relatives in southern Lebanon when the fighting began. She and her husband fled north in a car with their two children and five nieces and nephews. They were about 100 yards from a bridge when it exploded, killing and wounding many people. In a panic, they tried to turn around and crashed their car. Meanwhile, in the United States, the government has spent about $200,000 helping Americans fleeing Lebanon as they return to the United States, and that amount will grow as an estimated 7,500 to 15,000 people arrive. The government provides temporary assistance to citizens and dependents identified as having returned from a foreign country because of destitution, illness, threat of war or similar crisis. As a result of fighting in Lebanon, a repatriation center opened Thursday at Baltimore-Washington International Thurgood Marshall Airport. Another center opened Friday at Philadelphia's airport. Many returning citizens won't need much help, but for those who do, the centers are staffed by medical and mental health professionals. The centers also have phone banks and computers to help people contact friends and relatives. After all the citizens have been through, "isn't it nice to have someone say welcome home and I'm hear to help you get wherever your final destination is," said Wade Horn, an assistant secretary with the Department of Health and Human Services. Most of the 60 greeters at Baltimore are state employees, as are the greeters in Philadelphia. The federal government reimburses the states for their expense. Officials expect to greet and assist refugees for another five days. The purpose of the program is to help get people to their homes or other destinations as smoothly as possible. In the majority of cases, the evacuees won't need much in the way of assistance, and they pay their own way for their lodging or for the airplane tickets to their next stop. In some cases, people had to flee without their credit cards, or they may not have access to money to pay immediately. The government buys the lodging or tickets for them, but the person getting the assistance signs a note promising to repay the money. In a small number of cases, when a citizen is truly destitute, the government will pick up all the expense of getting them to their final destination, Horn said. Horn estimated that about 800 people had been helped through the program so far. Typically, the program assists 200 to 250 people annually. The federal government allocates up to $1 million for the repatriation program.